Recently, a reader of our Ing.dk blog asked for more detail on the Nexø II DPR system and high pressure tank. Thus, let us look into that in this post. The simplest way to operate a liquid propellant rocket is by Pressure Blowdown (PBD). A mode of operation where the propellant tanks are typically filled to 2/3 capacity with liquid and the last third is filled with pressurized gas. The pressurized gas is then used to drive the engine. Nexø I flew in this way. July 23rd 4:38 PM, Nexø I launches from Sputnik. Photo: Carsten Olsen. Second up on complexity ladder comes Dynamic Pressure Regulation (DPR). In this mode there is no significant ullage in the propellant tanks, they are filled close to 100%. Instead a pressure tank with gas under very high pressure and a set of control valves are integrated into the system. This system can then supply the propellant tanks with feed pressure as the tanks are emptied. Nexø II will fly using such a system and we already have some good experience in operating the BPM5 engine in this way. Thanks to the DPR system, we were able to put the “Franken-5” engine through a massive 35 seconds full load test on October 10th 2016! If you continue further up the complexity ladder, you will hit turbo pump country. We are not quite there yet, but we are still playing around with it in the dark hours of the night. We will tell more about that some other time. 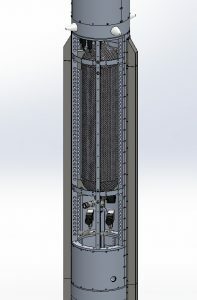 The DPR system on Nexø II is very similar to the system we know from the test stand, the main difference is the pressure tank. On the test stand it consist of two common diving bottles totaling 24 liters. Such diving bottles are obviously too heavy, so for Nexø II we purchased a 20 liter composite tank, which is approved for 300 bar. The tank itself weighs 12 kg. It is currently in transit from China. The regulation of the pressure is going to happen with the same type of valve that we use on the test stand, that is two piece of our faithful HYDAC PWK06020W sponsored by HYDAC. In addition, a main valve, located between the high pressure bottle and the control valves. The main valve is required since the two control valves are leaking a little bit at high pressure. That is not really an error on the valves, they are actually designed to control hydraulic oil, no pressure gas in a rocket. We are just using them for a purpose quite far from the intended use. But that is how we usually do stuff. High-pressure tank and its valves built into a 300 mm Nexø-class airframe. Graphics: Thomas Madsen. With pressure sensors, pipes, fittings and the necessary extension of the airframe the entire DPR section will weigh in at about 20 kg. It comes on top of the 145 kg of Nexø I and thus we expect to have a dry mass of 165 kg. We intend to fill the propellant tanks 95%, thus Nexø II will carry 53.7 kg of ethanol and 71.5 kg LOX, a total of 125.3 kg of propellant. 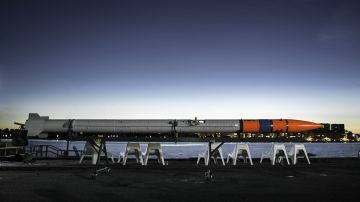 Hereby Nexø II is expected to have a Gross Lift Off Weight of approximately 290 kg! The BPM5 engine is nominally 5000 N. We lose, however, about 10% to drag on jet vanes, thus we have actually only 4500 N available. With a GLOW 290 kg, we have an expected Thrust To Weight Ratio (TTWR) of 1.58 at lift off and thus a start-acceleration of just 5.7 m/s^2. It may not seem like much if, for example, compared to Sapphire, which accelerated at 38 m/s^2. The launch of Nexø I showed, however, that we can keep the rocket vertically even if the acceleration is as low as 2 m/s^2! So we consider it safe to launch Nexø II in this way. Data visualization of Nexø I’s flight shows a vertical acceleration as low as 2 m/s^2 during a large part of the flight. Despite this, the rocket kept itself completely vertical. What performance can we actually expect from the DPR system? Let’s look at data from the October 10th BPM5 test to answer that question. Motor-data from recent, record-long BPM5 test. From the first set of graphs we see that the motor hits main stage and 15 bar at T + 5.1s and shuts down around T + 37.8s, thus we have 32.7 seconds at full throttle. Data on the consumption of compressed gas from the same test. In the same period, we can see that the pressure in the high pressure system drops by 128 bar. As the total tank volume is 24 liters, we used 2,640 standard liters of helium. It was used in 32.7 seconds, resulting in a consumption of 94 liters / sec. This also fits well with the graph at the bottom right showing consumption of helium as a function of time. Please note that the apparent consumption decreases, it is a thermodynamic effect. By expansion of the high pressure gas is cooled down and “shrinks”, this effect is obviously greater the greater the pressure drop. Should we fly with full throttle on Nexo II, we must therefore maintain a helium consumption of approximately 90-100 liters / sec for the entire flight. With the above-mentioned fuel quantities, we have fuel for about 50 seconds. It gives a consumption of 4500-5000 liters of helium. With a 20 liter bottle at 300 bar, we actually 6000 standard liters of helium on board, so there is a small excess. The next natural question is how high and how fast Nexo II will fly based on this. To answer this, I have done some simulations, it is quite simple iterative calculations in Matlab. If you would like to play around with such simulations, the [Dark’s orbit calculation Note] (http://dark.dk/documents/technical_notes/banenote.pdf) is highly recommended. Expected acceleration, speed and altitude of Nexø II, if all goes well. As we see, we start out with an acceleration of 5.7 m/s^2 increasing to 11 m/s^2 at MECO. Here we have accelerated to a speed of 400 m/s. After MECO Nexø II will coast to its apogee at 15.3 km at 84 seconds. It is not really impressive numbers for a rocket that is as many hours in as Nexø II does. But here we must remember that the purpose of the Nexø rockets has never been to fly high and fast. 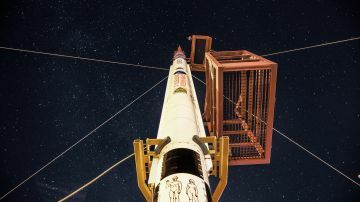 They serve rather as technology demonstrators for the Spica rocket and is an important step towards being able to operate and launch a 12 meter high and 4 ton cryogenic bi-prop rocket. It is not something you just do … It requires training and experience and to learn from your mistakes. Despite Nexø I did not fly higher than it did, it was one of the absolutely most instructive launches we’ve had. We sincerely hope Nexø II will perform better than Nexø I and come closer to fulfilling its potential. 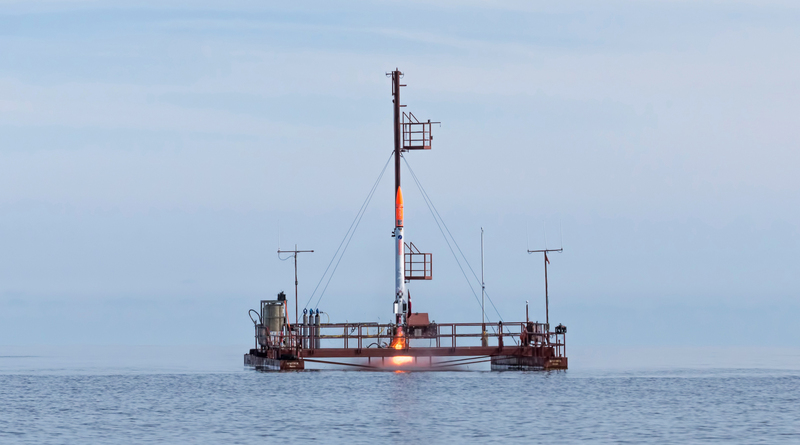 But first and foremost Nexø II is a technology demonstrator and training vehicle. It is not intended to be a record breaker of any kind, it will however be the first actively guided liquid bi-prop DPR amateur rocket in the world, as far as we know. Very interesting report of the advances. Its very nice to see people doing something what is told to be out of reach. I suppose that there is a lot of other great ideas but too green to be published. Should be interesting to see “the reborn of pumps”. The interesting point to take in account is how important is accumulate experience, properly record it, store and lead down to new comers in the group both for growth or to allow natural personnel rotation. If not the group will grow older and lose some of it strength and will for new efforts.  I form part of an old non profit association and more frequently that you want somebody levees the group without passing his experience in a particular field. Se you and great achievements!